Leaving the theater I was disappointed in Avatar’s marketing efforts. If only they told me this movie was a Planetary Romance I would have had much more interest in watching it. Avatar is the first good Planetary Romance in a long time. They are hard to pull off with the last really good example being Dune. A planetary romance is a story style where the setting becomes the main character. 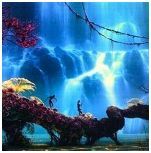 In Avatar we get to explore Pandora, it’s inhabitants, and the unique interconnectedness of everything on the planet. I was so proud with the introduction into the depth of the setting. This begins with a subtle clue from the scene where Dr. Grace and Norm studying the root structure of a tree and noticing how vast that structure stretches and how interconnected it is with all other plant roots in the area. The big reveal after Jake slowed down listening to Neytiri and actually looked around is a breathtaking scene with all the plants glowing and even the moss lighting up with each foot steep. 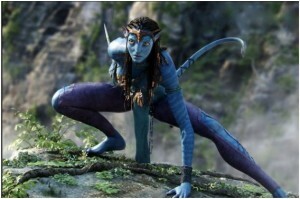 The Na’vi are the indigenous species of Pandora. 9 to 12 feet tall, blue skin with bipedal humanoid features. One of the most distinctive feature is the series of tendrils that protrude from the back of their head masked by their hair which is in a long braid. These tendrils are used to make a neural connection with the Pandora’s plants and animals. This gives the Na’vi a more direct means of communicating with their environment and even leaving impressions upon the fauna that can be recalled by latter generations. Called a Direhorse by the humans. It is used by the Na’vi like a horse as a mount to ride around on. Standing in at 13 feet tall and 14 feet long, mostly grey in color with blue stripes. The Pa’li has two long antennae that the rider connects to the tendrils in the end of their hair. Through that connection the rider can direct the mount through mental commands. This makes the training process very quick because once the connection is made all the rider has to do is think stop, go, slow down and gets the desired result. The tricky part in riding is for the rider to realize the Pa’li is like an extension of self rather than this other thing to be ordered around. Called a Mountain Banshee by the humans. 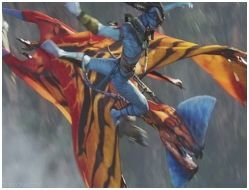 The Ikran are a flying predator with four wings used as a mount by only the strongest of the Na’vi warriors. Like the Pa’li they make a neural connection through the Iran’s antennae but this is a life long connection meaning an Ikran will have only one rider. This process is a dangerous one performed alone in front of the other warriors. This part of the movie has many similarities with Dune and the Fremen sandworm riders who go through a similar ritual to become a true warrior and one of the tribe. The Ikran are mythically like the Sandworms in Dune leaving the Toruk like Shai-Hulud. I loved how the name means last shadow because it’s the greatest predator of the skies with nothing as large or as fierce as it. The Toruk has only been tamed five times before. Those instances were at times of great trouble where their riders brought the tribes of Pandora together to overcome the adversity. The Na'vi celebrate the Trouk in dance, song, and with elaborate totems that symbolizes both the fear and respect accorded to the creature. Toruk is massive in size, scarlet in color with black stripes and a midnight blue crest on top of the head and on the lower jaw. Eywa is the great spirit of Pandora revered by the Na’vi and represented through the interconnectedness among all the flora, fauna and indigenous peoples. The Eywa is most represented through the Tree of Souls, Tree of Voices and the Atokirina which are little floating airborne jellyfish like creatures. For more on the interconnectedness read Avatar’s Religious Experience.